Heeft u een vraag voor Lanta Dareen Resort? Lanta Dareen Resort, gebouwd in 2008, is een aanwinst voor Koh Lanta en een slimme keuze voor reizigers. Met haar locatie op 10 km afstand van het stadscentrum en 84 km van het vliegveld, trekt deze 2.5-sterren accommodatie jaarlijks vele reizigers aan. Niet minder uitzonderlijk is het feit dat veel attracties en monumenten in de buurt liggen, zoals Khlong Khong Beach, Baan Klong Tob Klein Ziekenhuis, Lanta Dierenwelzijn. Lanta Dareen Resort biedt vele voorzieningen om uw verblijf in Koh Lanta zo aangenaam mogelijk te maken. Om gasten een maximaal comfort te garanderen biedt de accommodatie gratis wi-fi in alle kamers, taxi service, ticket service, bagageopslag, wi-fi in openbare ruimtes. Het hotel biedt 19 prachtig ingerichte kamers voor gasten, velen zijn inclusief schoonmaakproducten, kledingrek, oploskoffie, spiegel, privé ingang. De accommodatie biedt fantastische voorzieningenen, inclusief zwembad (buiten), duiken, solarium, zwembad (voor kinderen), biljart, zodat u kunt onthaasten na een drukke dag in de stad. Geniet van een geweldige locatie en ongeëvenaarde services in Lanta Dareen Resort. De minimumleeftijd van gasten is: 15 jaar. Voor; ligging, zwembad, goed onderhouden terrein, scooterhuur en andere boekingen makkelijk en tegen goede prijs te regelen met de receptie Tegen; matras oncomfortabel, ventilator op kamer maakt hels kabaal, restaurant nodigt totaal niet uit tot eten (echter genoeg leuke tentjes op loopafstand). Voor minder dan €20 per nacht voldoet het aan de verwachtingen. Basic maar rustig verblijf, geen luxe maar ze doen hun best voor je! We planned to stay two nights but stayed a week as we loved it so much. The staff were incredibly friendly. 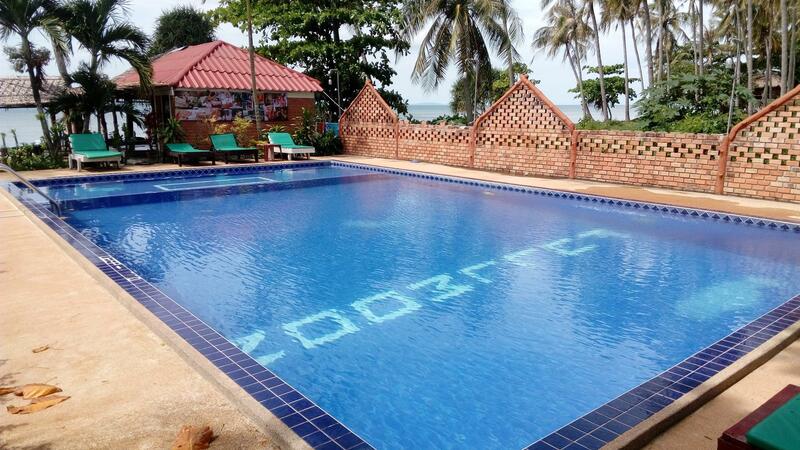 It has a perfect location, great facilities such as restaurant, pool, bike rental and rooms all for a great price. The beach is on your doorstep and a short walk along the beach to lost of other great bars and restaurants. Highly recommend. We rented bikes every day and did a variety of activities! We had a lovely stay and extended with two more days. Located on the beach at a quiet place on Klong Khong though not for swimming when it's low tide due to the rocks in the water. It did not bother us as we prefer the pool which was kept clean during the day from falling leaves however the water was not quite as clear as we would have wanted it. The hut, we had one with aircon, was in fine condition and it had a small terrace in front with chairs and a table from where you can enjoy some shadow and the nice garden like wiews. We didn't watch the television and would have preferred a fridge instead. 7 Eleven and local restaurants are easily accessible within 10 minutes walk. The owners are very kind people who do their utmost to make your stay as nice as possible and they offer nice food in their restaurant (had an excellent fried whole fish first night (on order), scooter rental and travel and tour arrangements as well. We can recommend this place. Our stay at Dareen was perfect. The hotel manager was the friendliest person we met on our trip so far. He helped with everything. there was some confusion at the start of our trip regarding payment as we thought we had a prepaid but that was all squared away. The resort provided free scooters to get around Koh Lanta and I would highly recommend doing this. the location was a bit quiet in the off season but I'd say in High season would be a great spot. Overall would recommend for a quiet getaway. We stayed here for many nights, enjoyed it so much! Very nice staff, clean and comfy room, we didn't have A?C, not necessary, excellent swimming pool, good breakfast and restaurant for lunch, drinks, etc. Great location, walking distance to town! The only drawback was the early morning call to prayer but not really a problem! Close to shops and 7-11, nice beach!! My stay at Dareen Resort was perfect, exactly what I needed. If you are looking for a peaceful, secluded beach within walking distance of many beachfront restaurants than this is the place. The staff is friendly and helpful and will arrange for all your activities. Breakfast was great also! We really enjoyed our stay at Lanta Dareen resort! Staff are very helpful and very friendly! Food is great! Good location, very quite but still near 7,11's etc. Right on the beach. Amazing when the suns going down! Cute out door area and pool! Over all perfect stay. Very good value for money. We will defiantly be going back. We were made to feel very welcome throughout our stay and we ended up extending. The staff are really nice and try to go out of their way to help you without being overbearing or pushy. They are improving services on offer such as massages etc. everything we organised through them was done with ease and well priced. Lovely to be on the beach and have a decent pool too. The western food is not the best but the Thai food is really great. Our fan room is a little dated but it's good value for money. Best thing is to get a bike and explore the island and this is a great place to set off from. Would definitely recommend a stay, maybe the air con rooms seemed newer/better but we were happy regardless. We travelled as 2 female travellers and found all of the staff extremely forthcoming, no pressure to book day trips or even eat at the resort but we did and Dehab cooks a mean pad thai!!!! Perfect location for us and close by to local 7eleven, pharmacy and other restaurants if needed. The resort was quiet due to us visiting in monsoon season but we had some beautiful weather so made full use of the empty pool area. All of the staff are constantly maintaining the area and the surroundings are just perfect for an island get away. Only thing I didn't like was that we had bugs staying with us rent free but this is a given being as we stayed in a bungalow and advisable to have an air-con room during peak seasons as bungalows have potential to get very hot, luckily it wasn't overly hot while we stayed and we had a ceiling fan. Beautiful beautiful resort, would 100% go back!! The staff were so friendly and helpful, they really went above and beyond. They drove us to the National Park and to Koh Lanta Old Town. The beach in front of the hotel is not great, its very rocky, but the pool is good. The food in the restaurant is great and reasonably priced. Good location near a few shops and on the beach. Got a nice little pool. We stayed in fan room and it was very hot but bearable. Nice staff. Friendly owners. Right on the beach and the pool is not too bad too.